From a technical point of view the Internet is a collection of thousands of networks, distributed throughout the world, that agree to communicate using certain rules or protocols. Each site on the Internet has a unique numeric address called its IP address and usually a corresponding name called the domain name. Information is passed around the Internet in packets. Each packet contains the address of the sender and the address of the destination. The packets can take different paths through the Internet. Its up to the software at the destination to receive the packets and reassemble them. The emphasis is placed on the packets, not on the connections between systems. Users generally access sites by giving a domain name; the hardware and software convert a domain name to an IP address. Many of the services operate according to a client/server model. A program called the client is started on one system and contacts a program called the server at another computer on the Internet. The client sends the commands typed or given by a user to the server. The server sends a reply to the client, and the client presents the information to the user. 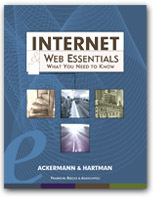 All information on the Internet is in digital format. This includes text, programs, charts, images, graphics, video, and audio. When using the WWW you work in a hypertext or hypermedia environment. A Uniform Resource Locator (URL) specifies items, services, and resources. These are used by Web browsers to specify the type of Internet service or protocol to use and the location of the item. The URL for the Web page "Abraham Lincoln: Internet Resources from the Library of Congress," for example, is http://lcweb2.loc.gov/ammem/alhtml/alrel.html. The protocol or service in this case is HTTP, or Hypertext Transfer Protocol, and a Web browser using it would contact the Internet site lcweb2.loc.gov and access a document named alrel.html. The documents on the WWW are called Web pages. These are written and constructed using a language or set of rules called Hypertext Markup Language (HTML). You can access the Internet by having a direct connection from your computer to a network. This is often the case when your company or campus has a network installed in offices, classrooms, labs, or residence hall rooms. To get connected to the Internet youll need the proper device to connect to your organizations network and (possibly) the IP address for your computer and for a domain name system. Another way to connect to the Internet is to use a modem to call an Internet service provider (ISP) and gain access through a PPP (Point-to-Point Protocol) connection. In either case you may have to configure an email client and Usenet news client to handle incoming and outgoing email and reading and posting messages to Usenet newsgroups. Links to some resources that go more deeply into Internet technology. Guides to and lists of ISPs.